Trekr is the ultimate travel washcloth that dries quickly and easily rinses clean every time you use it. It's ideal for everyday use, even when you're covered in mud, sweat, and sunblock. It's made from QuickDri nylon material that exfoliates and dries crazy fast so it doesn't get smelly. This makes it perfect for people on the go: adventure travelers, campers, backpackers, RVers, cyclists, fitness enthusiasts, and military personnel. They easily stay clean unlike cotton and microfiber towels, which means convenience and quick access. You could be covered in mud, sweat, and sunblock and your washcloth simply rinses clean after every use. And thanks to the QuickDri material, they stay odor free and are bone dry in 10-15 minutes! That's much faster than cotton or microfiber. Plus the elastic loop doubles as an easy roll-up, compression strap. 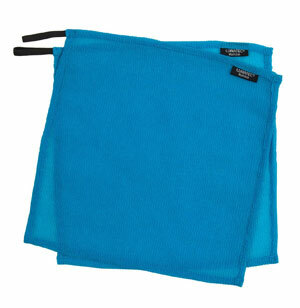 Trekr Travel Washcloth is made with a super light nylon material and is sure to keep you clean in the outdoors. The woven texture works really well for exfoliating your skin, which feels great at the end of a particularly dirty day. In addition, they double for cleaning cookware but most importantly they are convenient and work exceptionally well for when you feel sweaty or grimy. You'll feel reinvigorated and ready for more adventure! Never needs washing because it rinses clean every time you use it. Lathers great and leaves your skin feeling polished and clean. Just like the spa. Quick drying prevents odors and keeps you mobile. Elastic loop doubles as its own compression strap. Takes virtually no space and is lightweight. An invaluable, multi-function item for travel, camping, and backpacking. Works great for your washcloth at home too.